The Presto Air Daddy air fryer, model 03421, allows you to cook large meals for yourself, your family and your friends. The 4.2 quart basket has ample room for multiple food types that can be cooked separately when a divider is used (dividers must be purchased separately). 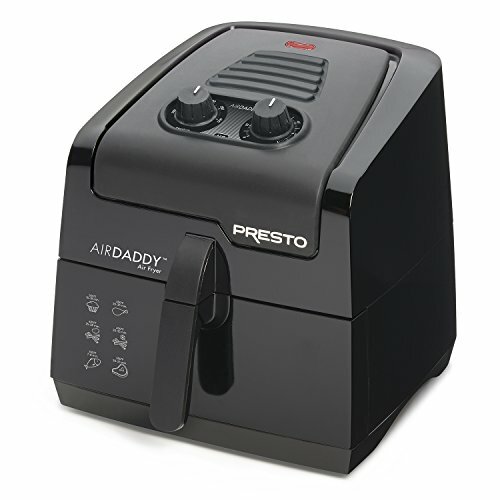 The Presto Air Daddy is available at a reasonable price, particularly for a large air fryer. The appliance is simple to use, with knobs that adjust both time and temperature. There is also a handy guide printed directly on the air fryer that shows you how to cook cakes and muffins, beef, chicken, fish and french fries from fresh or frozen. Large size lets you cook as much or as little as you like. Easy to use design has virtually no learning curve. Automatic shutoff ensures no food will be cooked longer than you intend. The air fryer is not shipped with any additional accessories. It does come with a use and care manual that includes detailed instructions on how to prepare foods such as chicken, hamburgers, shrimp, egg rolls, cupcakes and more. The use and care manual also includes 15 unique recipes. The Presto Air Daddy is 14.9 pounds. It measures at 13.4″ x 11″ x 11.2″. This model is only available in black. The design is cohesive throughout, with a black handle and black knobs for temperature and time control. The shape of the Presto Air Daddy is somewhat boxy, which may be preferable for those who have multiple appliances on their counter tops. The square basket measures 4 quarts to provide plenty of space for cooking. The hard plastic material is sturdy and can be fully immersed in water for easy cleaning. It’s large enough to hold whole chickens, pans for cakes and muffins, French fries, and much more. The Presto Air Daddy offers manual controls for both temperature and time. This keeps the learning curve low, as you only need to turn the knobs to the temperature and time you desire. The handy cooking guide that is printed directly on the Presto Air Daddy tells you exactly how long and at what temperature to cook the most popular foods. The temperature controls vary from 200 to 400. The timer is available for up to 60 minutes. This air cooker automatically shuts off when the timer goes off, keeping food from being overcooked. The Presto Air Daddy has the ability to fry, bake, roast and broil. The air fryer has a cool touch exterior. Most owners of the Presto Air Daddy are very satisfied with this air fryer. Home chefs agree that the Presto Air Daddy functions very well. They love that it cooks food quickly, even when prepared from frozen. The few negative reviews generally focus on the size of the air fryer. A 4.2 quart air fryer takes up a great deal of room on the counter top. The Presto Air Daddy air fryer has a standard one year warranty on parts that are defective due to materials or workmanship. The company will replace or repair any parts that default within one year of the purchase date. Presto will not repair any items that have become damaged due to accidents or misuse of the air fryer. Removable fryer basket that is completely submersible when cleaning. Easy to use temperature and timer controls. Sleek design fits with any decor. Should I Buy the Presto (Air Daddy) 03421? The Presto Air Daddy is a no frills air fryer that is made to serve a large amount of food. If you are seeking an air fryer to feed your family or friends, but don’t want to spend much money and don’t need extras, this may be the air fryer for you. On the other hand, if you prefer an air fryer with a digital screen and preset controls, you may wish to look elsewhere. If you own this Presto (Air Daddy) Air Fryer we’d love to hear from you. Share your experience with this airfryer model below.